Determine the overall track conditions including the starting line. If the conditions vary from hard-packed to loose loam, you’ll likely want a versatile tyre like Dunlop’s MX33. For medium-hard terrain, the MX52 is your best choice. 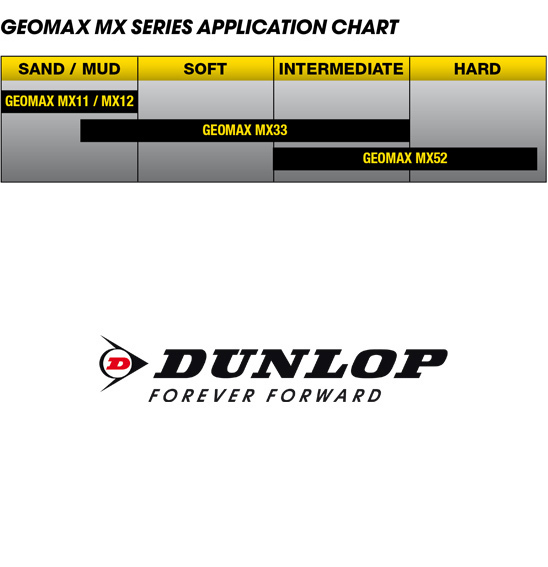 For deep sand or mud, Dunlop’s MX11 or MX12 is the tyre of choice – the MX12 rear and MX33 front are a popular combination for many pro riders on sandy tracks. If the ground has a cushion to it, rutted with soft berms, you’ll need the MX33 that will penetrate through the loose soil. Let the dominant condition dictate your choice after considering the start section. Don’t be afraid to mix off-road tyre patterns front and rear to feel more comfortable. For more information,refer the Geomax Terrain Chart below (under "more information").